One of my college literature professors — or possibly all of them, those years are difficult to recall in much detail — said something about how the sign of Great Art is that it can be interpreted in multiple ways. Of course, that can also be the sign of a great failure: not a singular failure, but failure on multple levels. The website (which includes some “not safe for work” language), started rising on reddit's “Internet is Beautiful” subforum shortly after midnight Tuesday, and by lunchtime had officially gone viral: if you were online, your probably saw it. 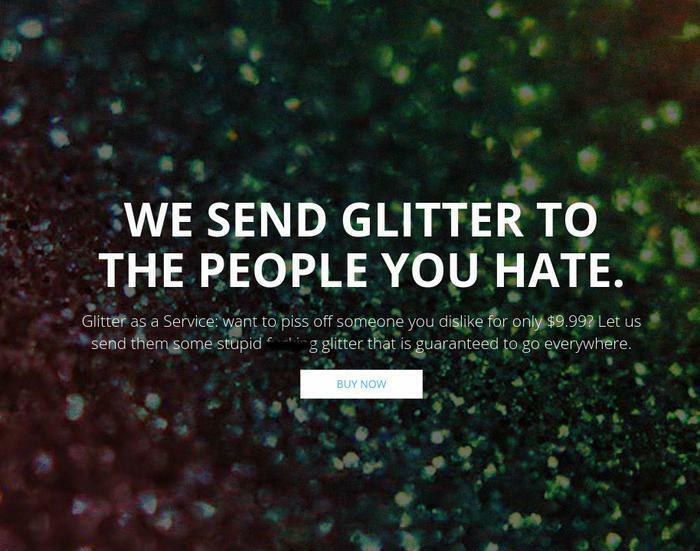 As its name suggests, ShipYourEnemiesGlitter promises to mail your chosen enemy an anonymous envelope full of loose glitter, for $9.99 (in Australian dollars). Is this a real business? Ten dollars is definitely an inflated price to pay for an envelope of glitter – even with the U.S.-to-Aussie dollar-exchange rate taken into account. We f*cking hate glitter. People call it the herpes of the craft world. What we hate more though are the soulless people who get their jollies off by sending glitter in envelopes. We've had enough so here's the deal: there's someone in your life right now who you f*cking hate. Whether it be your sh*tty neighbour, a family member or that b*tch Amy down the road who thinks it's cool to invite you to High Tea but not provide any weed. So pay us money, provide an address anywhere in the world & we'll send them so much glitter in an envelope that they'll be finding that sh*t everywhere for weeks. We'll also include a note telling the person exactly why they're receiving this terrible gift. Hint: the glitter will be mixed in with the note thus increasing maximum spillage. Q: My recipient got glitter in both eyeballs, is now blind and would like to file charges. Help?